We now have an alleged release date for Nvidia’s next Turing graphics card to sit at the bottom-end of the range, which is rumored to be the GeForce GTX 1650, and a benchmark has been spotted giving us an idea of performance – plus there will apparently be a 1650 Ti variant (with faster video memory). According to Videocardz, the GTX 1650 is expected to launch on April 22, just three weeks from now, which is roughly in line with previous speculation that pegged the release for the end of April. The Ti version will follow shortly thereafter, so things will happen the other way round compared to the GTX 1660 GPUs. As mentioned, the tech website reports that there will also be a GTX 1650 Ti and this will have 4GB of GDDR6 video RAM (as opposed to 4GB of slower GDDR5 memory on the base GTX 1650). Other alleged specs of the GTX 1650 include a base clock speed of 1395MHz (not 1485MHz as previously reported), with boost to 1560MHz. Wccftech.com further spotted an indication of the card’s performance – or at least a pre-production GPU – in the form of a Final Fantasy XV benchmark tweeted by TUM_APISAK (assuming this result is a genuine one). 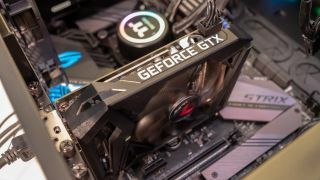 At Full HD resolution on high quality, the GeForce GTX 1650 apparently racked up a score of 3,803, which puts it just ahead of the Radeon RX 570 which was on 3,728, and a little behind Nvidia’s own GTX 1060 3GB which scored 3,901. Again, it’s worth underlining the fact that assuming it is legitimate, this isn’t a result from the finished graphics card with the finalized drivers, of course. Also, as the leaker himself observed, the Final Fantasy benchmark does favor Nvidia cards, so the performance against the GTX 1060 is likely a stronger overall indicator of what we’re looking at, as opposed to the AMD results. The GTX 1650 will supposedly come in at under the $200 mark, and we’ve heard previously that the price is expected to be around $179 (about £135, AU$250). It could possibly come in cheaper than this, though, because the RX 570 is pretty competitively priced right now (you can get one for less than $150 – around £115, AU$210 – on Newegg in the US). Although whether that will twist Nvidia’s arm on pricing is anyone’s guess, of course. Still, we shouldn’t have long to wait to find out. Note that Nvidia’s GeForce GTX 1650 has also appeared in an alleged 3DMark result for a gaming laptop, indicating that there will be a mobile version of this GPU. It looks to be a solid power bump over the existing GTX 1050 Ti for notebooks.